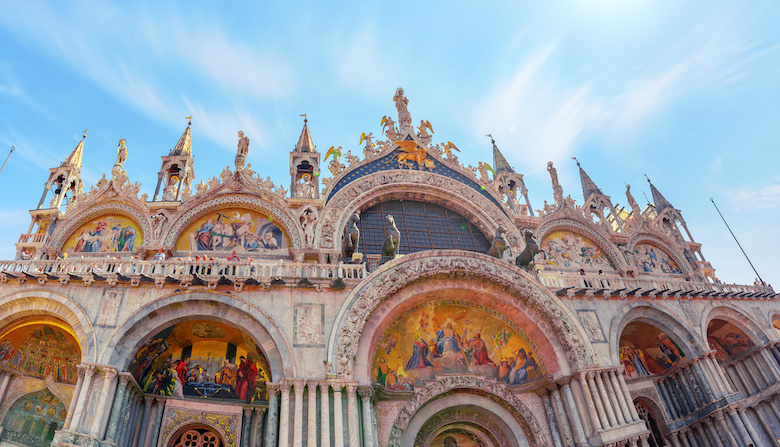 St. Mark’s Basilica used to be the magnificent symbol of La Serenissima, the Venetian Republic. Originally built as the private chapel of the Doge, it became the center of Catholic life in Europe in 828, with the arrival of St. Mark’s relics. Today, it is still one of the landmarks of the Floating City and a sight to behold for visitors. With all the hidden wonders and masterpieces hiding in there, discovering it on your own might be tricky. Keep reading for all the history, interesting facts, and tips on how to visit St. Mark’s Basilica in Venice. Experience the history of the once-thriving Republic of Venice with one of our top-selling Venice tours. Take in the splendor of The Floating City’s many canals and Venetian Gothic-designed buildings with our Venice in a Day tour. You’ll see historic buildings such as St. Mark’s Basilica and the Doge’s Palace, where the Doge of the Republic of Venice ruled. 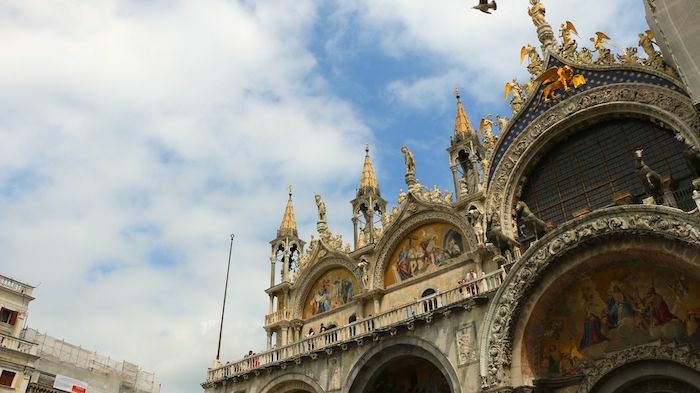 Did you know the St. Mark’s Basilica wasn’t built to preserve the holy ruins of the saint, but as the private chapel of the Doge during the Venice Republic? Its original name was “Basilica d’Oro”, Golden Basilica, because of the over a thousand square meters worth of golden mosaic tiles. In 828 A.D., the Doge Giustiniano Partecipazio expanded the chapel linking it to the existing church when St. Mark’s body arrived in Venice from Alexandria, replacing the city’s protector St. Theodore. From that moment, a winged lion, St. Mark’s crest, became the official symbol of the Venice Republic. After years of work, the Basilica was completed in 1071, and finally consecrated in 1094. In 1145, a deadly fire destroyed a huge part of the upper decorations inside of the Basilica. To prevent it from happening again, it was then covered by the marbles you’re able to admire today. 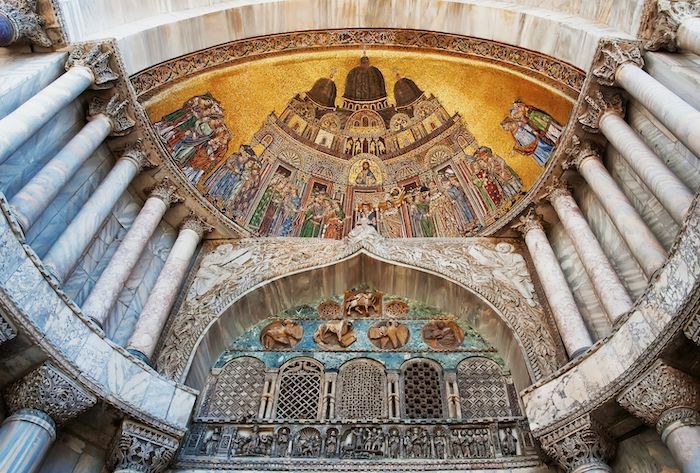 A bit later, in 1159, precious mosaic decorations were added to the walls and ceilings of St. Mark’s Basilica, replacing the old frescoes. The names of the architects and artists who contributed are unknown, but the predominant style is Greek-Byzantine with strong German and Arabic influences. The church served as the Doge’s chapel until 1807, when Napoleon turned it into a public basilica. 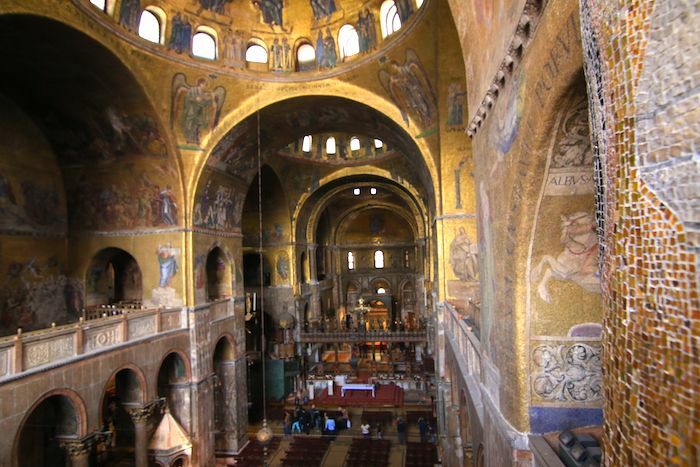 The layout of St. Mark’s Basilica is shaped like a Greek cross, divided into three aisles with five domes. As you get inside, you’ll be under the “Arc of the Apocalypse”, followed by the “Dome of Pentecost” and “Dome of Ascension” until you reach the incredibly decorated presbytery. “The Treasury of St. Mark’s” is a collection of precious objects and masterpieces kept inside of the Basilica throughout the centuries. You’ll see ancient vases, amphorae, enameled glasses covered in precious stones displayed throughout the perimeter. 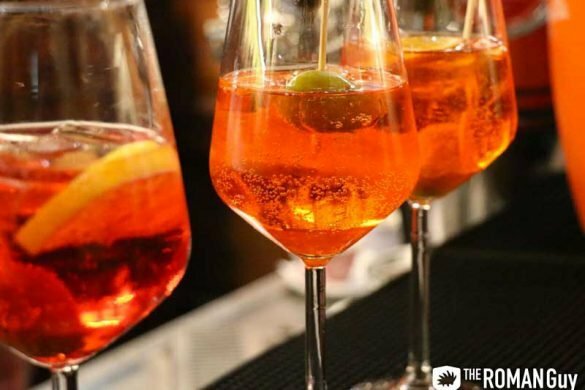 Among all of these, “Pala d’Oro” will definitely catch your eye once inside. 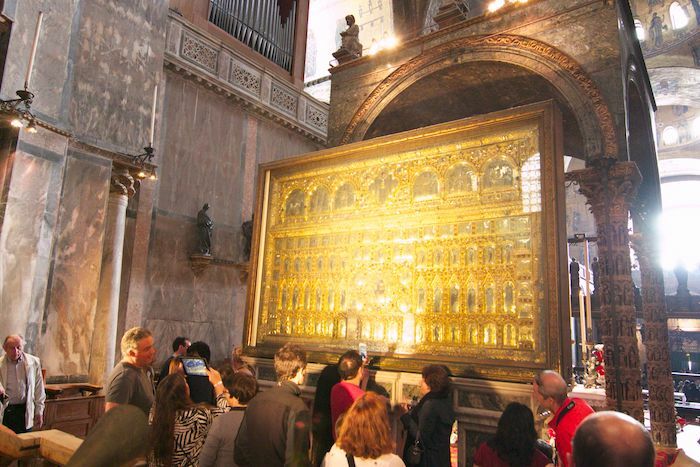 This outstanding golden high altar placed at the center of the church was created by famous Greek goldsmiths in 978 to be exposed during the most important ceremonies. It was then restored and enriched with images of Jesus during the Apostolic period. There are over eight thousand square meters worth of mosaic covering the interior of the Basilica, including the five domes. You could spend hours just looking at the ceilings. The artwork tells stories from the Holy Bible, myths and local legends, episodes from Virgin Mary and Jesus’ life and most of, all St. Mark’s. The contrast between the bright ceilings and darker marble floors actually represents the contrast between life in heaven and life on earth. If you’re curious about more interesting St. Peter’s Basilica facts in Venice but don’t know where to start, we come to the rescue! 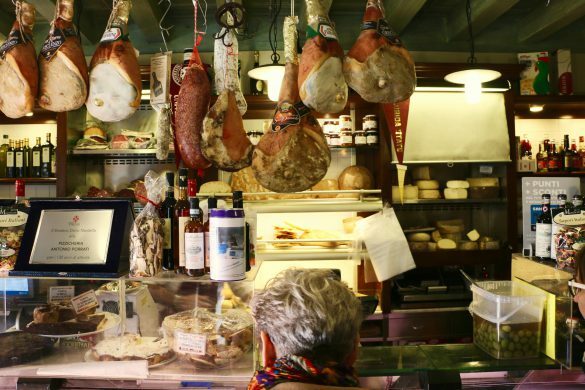 You can join a Venice tour guided by one of our local English-speaking guides! Lastly, the terrace overlooking St. Mark’s Square is also worth a visit. On your way up, you’ll see a display of rare tapestries and precious textiles, and the original horses of St. Mark’s Basilica. The ones you see in the facade outside are replicas to preserve the real masterpiece! Look out over the city of Venice, and maybe even catch a glimpse of some Venice hidden gems from above. The Basilica opens at 9:30 a.m. and closes at 5 p.m. Monday through Friday with last entry at 4:45 p.m. On Sunday and public holidays it is open 2 p.m. – 4 p.m. Keep in mind that during low season, from October until March/April, the Basilica closes at 4:00 p.m. The entry with no guide is for free, but you’ll have to wait in line quite a bit (from 30 minutes to 1-2 hours during peak times) before entering. The ticket to access the altar with the Pala d’Oro is €2, while the ticket to see St. Mark’s Treasury will be an additional €3. As any worship site, we recommend wearing the appropriate clothing when you visit the Basilica. If you have your knees or shoulders showing, you’ll be asked to buy a plastic wrap. You won’t be allowed to enter with a big luggage, but you can use the free lockers located in Ateneo San Basso (Piazzetta dei Leoncini). If you want us to arrange your private transfers in Venice (and beyond! ), contact us today. Check out our YouTube video and step-by-step guide about how to do Venice in a Day. 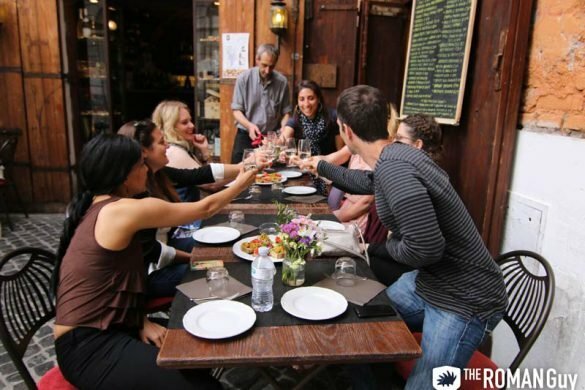 If you’d rather let us guide you, check out our Venice tours. Born and raised in Venice, Italy. I am obsessed with traveling and I always sleep with a suitcase under my bed. After studying abroad in the U.S, Australia and France, I've moved to Rome led by a passion for art, literature, and the italian culture. I am passionate about communication and branding and my #1 skill is making an appropriate Spotify playlist for every occasion.